S. Kadapparambil, K. Yadav, M. Ramachandran, N. V. Selvam, Tectona grandis leaf extract as environmental friendly corrosion inhibitor for SS304 stainless steel in hydrochloric acid, J. Sci. Ind. Res. 77(6) (2018) 349-352. Sandeep Dharmadhikari, Prabir Ghosh, Manivannan Ramachandran, “Synthesis of proton exchange membranes for dual chambered microbial fuel cells”, J. Serb. Chem. Soc. 83 (2018) 1-13. K. Yadav, A. Gupta, S. N. Victoria, R. Manivannan, Murraya koenigii as green corrosion inhibitor for mild steel in nitric acid medium, Indian J. Chem. Technol., 25 (2018) 94-100. A. Paraye, R. Sani, R. Manivannan, S. Noyel Victoria, Effect of pH and sulfur precursor concentration on electrochemically deposited CZTS thin films using glycine as the complexing agent, Applied Surf. Sci. 435 (2018)1249-1256. K. Yadav, R. Manivannan, S. N. Victoria, Chemical mechanical planarization of ruthenium using sodium hypochlorite based titania slurry, ECS J. Solid State Sci. Technol., 6 (12) (2017) P879-P885. Kavita Yadav, Jitendra C. Bisen, S. Noyel Victoria, R. Manivannan, Sodium hypochlorite as an oxidizing agent in silica based ruthenium chemical mechanical planarization slurry, Microelectron. Eng. 180 (2017)96-100. R. Sani, R. Manivannan, S. N. Victoria, One step electrochemical deposition of CZTS for solar cell applications, Chalcogenide Letters 14(5) (2017) 165-170. K. Sumithra, K. Yadav, R. Manivannan, S. N. Victoria, Electrochemical Investigation of Corrosion Inhibition Mechanism of Tectona grandis Leaf Extract for SS304 Stainless Steel in Hydrochloric Acid, Corr. Rev. 35(2) (2017) 111-121. Reshma R. Nair, A. Gupta, S. Noyel Victoria, R. Manivannan, Chemical Mechanical Planarization of Germanium using Oxone® based Silica Slurries, Wear 376-377 (2017) 86-90. A. Gupta, Y. N. Lakshmi, R. Manivannan, S. N. Victoria, Visible range photocatalysts for solid phase photocatalytic degradation of polyethylene and polyvinyl chloride, J. Chil. Chem. Soc. 62(1) (2017) 3160-3165. Alok Singh, R. Manivannan, S. Noyel Victoria, Simple one-pot sonochemical synthesis of copper sulphide nanoparticles for solar cell applications, Arabian Journal of Chemistry (2015) Accepted. S. Noyel Victoria, Rohith Prasad, R. Manivannan, Psidium guajava leaf extract as green corrosion inhibitor for mild steel in phosphoric acid, Int. J. Electrochem. Sci., 10 (2015) 2220-2238. R. Manivannan, B.-J. Cho, X. Hailin, S. Ramanathan, J.-G. Park, Characterization of non-amine based post-copper chemical mechanical planarization cleaning solution, Microelectron. Eng., 122 (2014) 33-39. T.-Y. Kwon, B.-J. Cho, R. P. Venkatesh, M. Ramachandran, H.-M. Kim, C.-K. Hong and J.-G. Park, Effect of oxide hardness on scratches in interlevel dielectric chemical mechanical polishing, Tribology Transactions 57(2) 2014 pp. 190-197 . B.V.S. Praveen, R. Manivannan, T.D. Umashankar, B.-J. Cho, J.-G. Park, S. Ramanathan, Abrasive and additive interactions in high selectivity STI CMP slurries, Microelectron. Eng. 114(2014) 98-104. T.Y. Kwon, M. Ramachandran, B.-J. Cho, A. A. Busnaina and J.-G. Park, The impact of diamond conditioners on scratch formation during chemical mechanical planarization of silicon dioxide, Tribol. Int., 67 (2013) 272-277. M.S. Kim, B.K. Kang, M. Ramachandran, J.K. Kim, B.K. Lee and J.G. Park, Removal of UV cured resin using hybrid cleaning process for nanoimprint lithography, Microelectron. Eng.114 (2014) 126-130. T.Y. Kwon, B.J. Cho, M. Ramachandran, A. A. Busnaina and J.G. Park, Investigation of source-based scratch formation during oxide chemical mechanical planarization, Tribol. Lett. 50 (2013) 169-175. M. Ramachandran, B.J. Cho, T.Y. Kwon and J.G. Park, Hybrid cleaning technology for enhanced Post-Cu/low-dielectric constant chemical mechanical planarization cleaning performance, Jpn. J. Appl. Phys. 52 (2013) 05FC02-01-06. B.J. Cho, H.M. Kim, R Manivannan, D.J. Moon and J.G. Park, On the mechanism of material removal by fixed abrasive lapping of various glass substrates, Wear 302 (2013) 1334-1339. H.M. Kim, R Manivannan, D.J. Moon, H. Xiong and J.G. Park, Evaluation of double sided lapping using a fixed abrasive pad for sapphire substrates, Wear 302 (2013) 1340-1344. R. Manivannan, S. N. Victoria and S. Ramanathan, Mechanism of high selectivity in ceria based shallow trench isolation chemical mechanical polishing slurries, Thin Solid Films 518 (2010) 5737-5740. R. Manivannan and S. Ramanathan, The effect of hydrogen peroxide on polishing removal rate in CMP with various abrasives, Appl. Surf. Sci. 255 (2009) 3764-3768. R. Manivannan and S. Ramanathan, Role of abrasives in high selectivity STI CMP slurries, Microelectron. Eng. 85 (2008) 1748-1753. T.-Y. Kwon, M. Ramachandran, J.-G. Park, Scratch formation and its mechanism in chemical mechanical planarization, Friction 1(4) 2013 pp.279-305 . B.V.S. Praveen, R. Manivannan, T.D. Umashankar, Byoung-Jun Cho, Jin-Goo Park and S. Ramanathan, Lanthanum doping of ceria abrasive to obtain robust CMP polish rates, Indian Patent Application No. 4103/CHE/2013 dt. 12/09/2013. Kavita Yadav, Manivannan Ramachandran, Selvam Noyel Victoria, “Electrochemical characterization of ruthenium using potassium bromated as oxidizer for titania-based CMP slurry”, ECS Meeting, Seattle, USA, ECS Trans. 85(6) (2018) 59-69. Sneha Tomar, A B Soni, R Manivannan, “Removal of cationic and anionic dyes from aqueous solution using Cocos nucifera fiber: Isotherms, Kinetics and Thermodynamic studies”, International Conference on Desalination- InDACON 2018, NIT Trichy, 20-21st April 2018. Akanksha Paraye, Arpita Shukla, Manivannan R, S Noyel Victoria, “Single step electrodeposition of CZTS thin films for solar cell applications: Effect of annealing time”, First International Conference on Energy and Environment: Global Challenges – ICEE 2018, NIT Calicut, 9-10th March 2018. Kavita Yadav, Rohith Prasad, S Noyel Victoria, Manivannan R, “Reaction mechanism analysis of mild steel dissolution in 1M phosphoric acid”, First International Conference on Energy and Environment: Global Challenges – ICEE 2018, NIT Calicut, 9-10th March 2018. Rabiya Sani, Akanksha Shelotkar, R Manivannan, S Noyel Victoria, “Glycine as a complexing agent for single step electrodeposition of CZTS”, Second International Conference on Applied Surface Science, Dalian, China, 12-15th June 2018. K Yadav, R Sani, S Noyel Victoria, R Manivannan, “Chemical mechanical planarization of Ru using sodium hypochlorite based titania slurry”, Second International Conference on Applied Surface Science, Dalian, China, 12-15th June 2018. A Gupta, S N Victoria, R Manivannan, “Chemical mechanical planarization of germanium using polymorphs of titania as abrasive and hydrogen peroxide”, International Conference on Nanotechnology : Ideas, Innovations & Initiatives – 2017, ICN:3I-2017, IIT Roorkee, 6-8th Dec 2017. K Yadav, R Manivannan, S N Victoria “Electrochemical characterization of ruthenium dissolution and chemical mechanical polishing in hydrogen peroxide based slurries”, International Conference on Nanotechnology : Ideas, Innovations & Initiatives – 2017, ICN:3I-2017, IIT Roorkee, 6-8th Dec 2017. Apeksha Gupta, S Noyel Victoria, R. Manivannan, “Chemo-mechanical planarization of germanium using potassium periodate based titania slurries”, ICPT Proceedings, Belgium (2017) pp. 195-200. S. Dharmadhikari, P. Ghosh, R. Manivannan, "Synthesis of proton exchange membranes using different polymeric systems for a dual chambered microbial fuel cell", International Conference on Membrane Technology and its application on Separation MEMSEP 2017, NIT Trichy, February 21st - 23rd, 2017. S. Dharmadhikari, P. Ghosh, R. Manivannan, "Characterization and Application of Synthesized Proton Exchange Membranes in Microbial Fuel Cell" CHEMCON 2016, Chennai, December 27th-30th, 2016. Reshma Nair, Apeksha Gupta, S. Noyel Victoria and R. Manivannan, “Chemical Mechanical Planarization of Germanium using fumed silica and Potassium peroxymonosulfate", ICMST 2016: International Conference on Material Science and Technology, Kerala, June 5th to 8th ,2016. Ankur Pandey, Kavita Yadav and R. Manivannan, “Solar Energy Assisted Synthesis of Nickel Nanoparticles”, CHEMCON 2015, IIT Guwahati, December 27th-30th ,2015. Kavita Yadav, Apeksha Gupta and R. Manivannan, "Glycine as a corrosion inhibitor for mild steel in nitric acid", International Conference on New Frontiers in Chemical, Energy and Environmental Engineering (INCEEE-2015), NIT Warangal, March 20-21, 2015 (Proceedings Page No. 13 & 14, ISBN 978-81-928314-1-1). Apeksha Gupta, Dushyant Patel, Sunil Meena and R. Manivannan, "Adsorption of hexavalent chromium on activated rice husk carbon", International Conference on New Frontiers in Chemical, Energy and Environmental Engineering (INCEEE-2015), NIT Warangal, March 20-21, 2015 (Proceedings Page No. 385 & 386, ISBN 978-81-928314-1-1). Zeenat Arif, A. B. Soni and R. Manivannan “Synthesis and Characterization of Oleic Acid Capped Metallic Copper Nanoparticle via Chemical Reduction Technique” 2nd International Conference on Nanotechnology (ICNT-2015), Haldia, Feb 19-22, 2015 (Proceedings Page No. 220-226, ISBN : 978-81-927756-2-3). Ankur Pandey and R. Manivannan “Synthesis of Nickel Nanoparticles using Chemical Reduction Technique” 2nd International Conference on Nanotechnology (ICNT-2015), Haldia, Feb 19-22, 2015 (Proceedings Page No. 242-246, ISBN : 978-81-927756-2-3). R. Manivannan, B.-J. Cho, T.-Y. Kwon and J.-G. Park, “Hybrid Cleaning Technology for Enhanced Post-Cu/low-k CMP Cleaning Performance” ADMETAPlus 2012 : Asian Session in Japan, 100-101. T.-Y. Kwon, R. Manivannan, B.-J. Cho, A. A. Busnaina and J.-G. Park, “The Impact of Diamond Conditioners on Scratch Formation during Silicon-dioxide CMP” ADMETAPlus 2012 : Asian Session in Japan, 16-17. H.-M. Kim, R. Manivannan, D.-J. Moon, T.-Y. Kwon, J.-H. Noh and J.-G. Park, “Evaluation of Glass Lapping Using Fixed Abrasive Pad”, ICPT Proceedings in France (2012) pp. 409-414. J.-G. Park, B.-K. Kang and R. Manivannan, “Challenges in 1x Design Node Semiconductor Device Cleaning”, ICFD 2012, Sendai, Japan, 374-375. U. S. Ansar, R. Manivannan, K. Rushing, C. Wang, Y. Li, E. Su, S. Venkataraman and Y. Li “CeO2 & SiO2 Slurries for FEOL Applications”, Lake Placid Meeting, USA (2011). S. Ramanathan, R. Manivannan and V. Vineeth, “High selectivity slurries for STI CMP”,ECS Meeting, Las Vegas, USA, ECS Trans. 33(10) (2010) 31-42. R. Manivannan and S. Ramanathan "Role of DL-Aspartic Acid in STI CMP Slurries", ICPT Proceedings in Japan (2009) 47-51. Ankita Verma, Ankur Pandey and R. Manivannan, "Corrosion inhibition of mild steel in nitric acid using glycine (gly) as green corrosion inhibitor, CHEMCON-2014, Chandigarh, Dec, 27-30,2014. Apeksha Gupta and R. Manivannan "Removal of nanoparticles from Cu/low-k surfaces using hybrid cleaning technology", National Conference on Nanoscience and Nanotechnology 2014, Bhilai (Review Poster) - Best Poster Presentation Award to Ms. Apeksha Gupta. Ankur Pandey and R. Manivannan "A study on synthesis of nickel nanoparticles using chemical reduction technique", National Conference on Nanoscience and Nanotechnology 2014, Bhilai - Best Oral Presentation Award (2nd Prize) to Mr. Ankur Pandey. Zeenat Arif, A. B. Soni and R. Manivannan "Synthesis and characterization of copper nanoparticles using chemical reduction technique", National Conference on Nanoscience and Nanotechnology 2014, Bhilai. Kavita Yadav and R. Manivannan "Murraya koenigii as a green corrosion inhibitor for mild steel in nitric acid medium", SCHEMCON-2014, Haldia. R. Manivannan and S. Ramanathan "Effect of additives in chemical mechanical planarization for shallow trench isolation", NCFCE-2007 Proceedings, IIT Guwahati. C.P.Krishnamoorthy, R.Manivannan, Abhijit P.Deshpande and S. Pushpavanam “Experimental Study of Surfactant Flushing of Non-Aqueous Phase Liquids in Porous Media” CHEMCON, New Delhi (2005). Gas Chromatography Analysis, Advanced Training Institute, Chennai. Faculty Induction Training Phase-I (Under TEQIP II), NITTTR Bhopal, 2nd - 13th June, 2014. 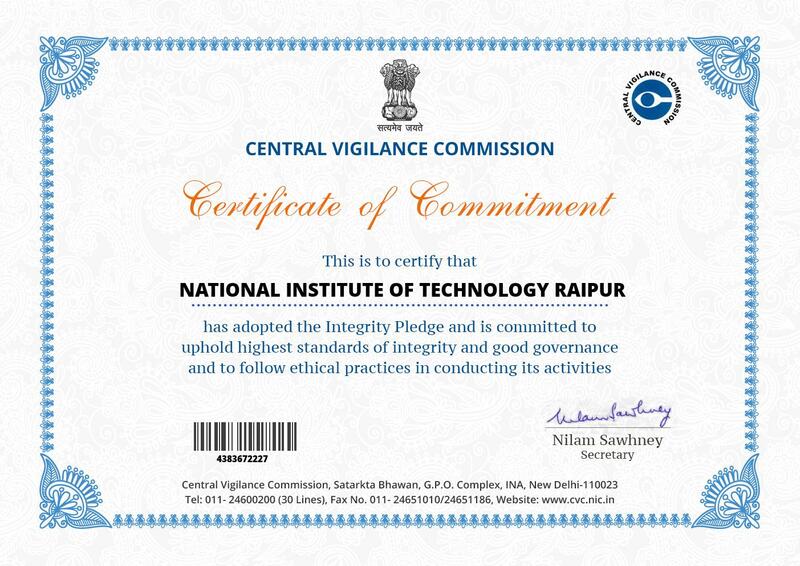 "Workshop on Academic Ethics and IPR" Organized by NIT Raipur, CGCOST, 4th & 5th April, 2014. "Workshop on Advanced Characterization Techniques" Organized by IIT Bombay, 12th May 2014. "Workshop on Collection Development of E-Books in Libraries" Organized by NIT Raipur, 14th & 15th Nov. 2014. "Workshop on Recent Challenges in Atmospheric and Earth Sciences" Organized by NIT Surathkal, 27th - 30th Dec. 2014. 1. "Renewable Energy & Environment (REE-14)" Dept. 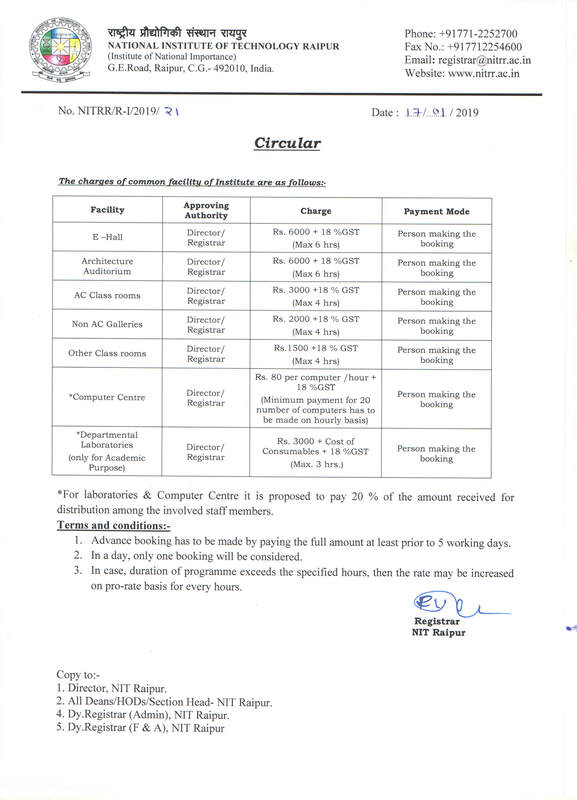 of Chemical Engineering, NIT Raipur,12th & 13th June, 2014 (Under TEQIP Phase-II). Co-ordinators : Mr. Dharm Pal & Dr. R. Manivannan. 1. "Chemical Process Modelling Simulation (CPMS-14)" Department of Chemical Engineering, NIT Raipur, 23rd - 27th, June, 2014. Co-ordinators : Dr. P. K. Chaudhari & Dr. R. Manivannan. 1. "Fundamental Electrochemical Principles Applied to Problems in Science and Engineering" Department of Chemical Engineering, IIT Madras, 10th - 14th Aug, 2014. 1. "Nanoparticles - Boon or Bane in Microelectronic Industry", in Recent Research Methodologies and Instrumentation Techniques on chemical and Bio-medical Engineering" held on 15th - 19th Dec. 2014, Organized by NIT Raipur. "Short Term Training Programme on MATLAB Programming and Its Engineering Applications" Organized by NIT Raipur, 26th-30th Dec. 2013. "Short Term Course on Thermodynamic Analysis of Modern Separation Processes" Organized by IIT Madras, 23rd - 29th Nov. 2014. Associate Member of IEI, Membership No. AM150977-5. Life Member of IIChe, Membership No. LM-53331. Life Member of ISTE, Membership No. LM-102348. International Journal of Advanced Manufacturing Technology. Outstanding Contribution in Reviewing from Elsevier - Journal of the Taiwan Institute of Chemical Engineers. BRAIN KOREA 21 Scholarship in South Korea. MHRD scholarship for my Ph.D programme. IITM Travel Grant for presenting the paper in overseas conference. Received a GOLD MEDAL for getting University Rank XIV from Adhiparasakthi Institution. Received a SILVER MEDAL for best academic performance in Engg for the period from 1999 – 2003 from Adhiparasakthi Educational Institution.